I developed the Lap Elevator after I invented an effect called the vanishing Aces, my dream was to after the routine just stand up and walk away. That was about 28 years ago, the design of the devise has changed many times during the years to this final product. It has a genius pulley system that will do all the work for you, No hands needed, just stand up and it is gone. Do not think of this item just to fool the magicians, wear it any time it is the perfect vanishing devise. To get in the ready position just grab your chare and sit down and it is ready to use. Now with the hands in the air just stand up and it is gone. It is finally here, the hottest seller at the 2006 FISM convention. This product I actually made up 28 years ago and have wore and used it ever since. It is a fantastic device no magician should be without. Just imagine to be able to lap anything at any time and when you are finished just stand up and walk away (no hands). It can not be cleaner than that. The Lap Elevator can be used both ways, instead of just getting rid of you things you can use it as a holder of your production props, load balls or even a Coke Bottle for later production. The Lap Elevator is worn on your body as a harness and is fully adjustable to fit you. 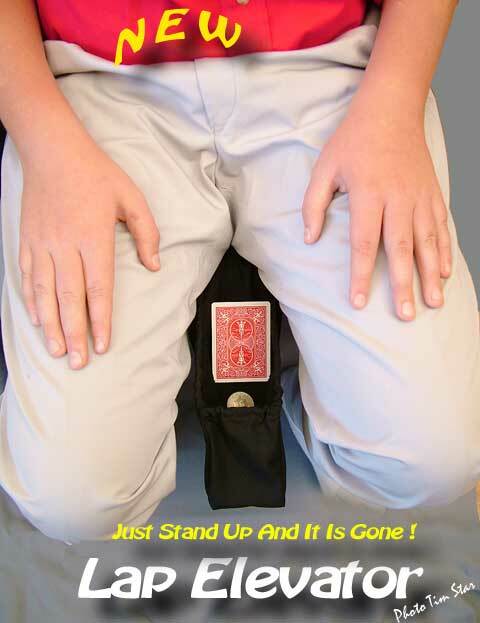 As you stand up (no hands used) it will automatically be pulled up on your back. It does not attach to your jacket in any way and no alterations to your jacket needs to be done. It takes just seconds to put it on and you are ready to go. Made of heavy duty stainless steel and fabric. The pickup bag has a very smart design that will hold your lapped items.